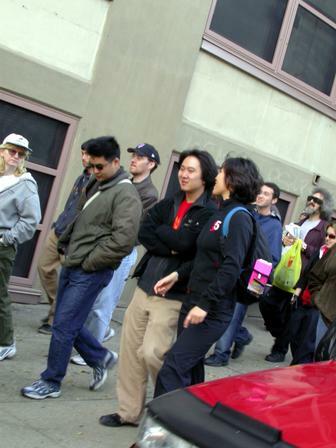 On October 25, 2003, 56 Forgotten fans…our largest turnout to date…roamed through what used to be called Downtown Brooklyn, an industrial region blessed with spectacular views of two of the most spectacular bridges in the world. 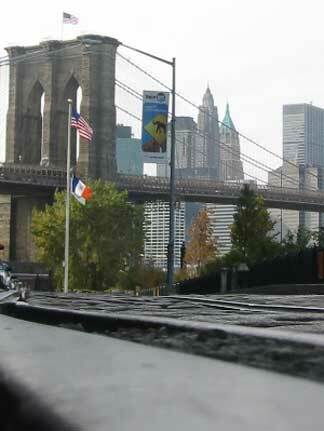 Follow us as we explore DUMBO, Vinegar Hill and Fulton Ferry. After two previous low-rated weather Forgotten Tours, we had sunny, 55 degree weather. Instant karma’s gonna get us. 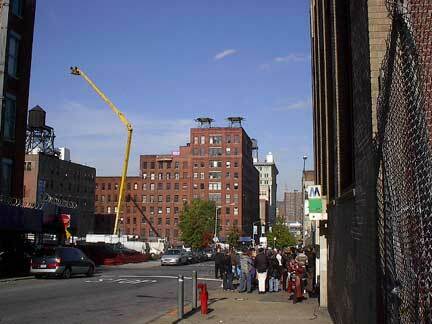 In the photo above left, Forgottoners gather at the York Street IND subway entrance on Jay Street; in the background, workers prepare a crane shot for the movie The Forgotten, yes, The Forgotten, shooting in the area and featuring Julianne Moore and Gary Sinise. You wouldn’t get me up in one of those. 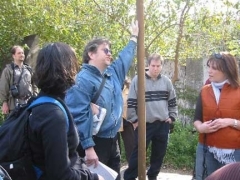 Throughout the neighborhood there were handwritten signs saying “Forgot”, undoubtedly confusing the major media, who couldn’t tell whether the signs referred to Forgotten Tour 14 or the movie. 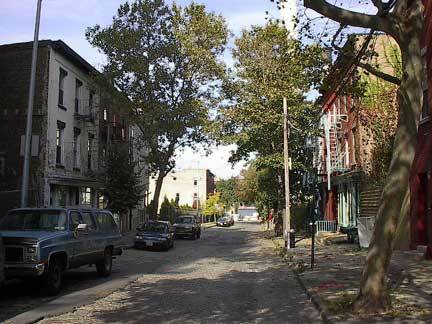 The tiny neighborhood of Vinegar Hill is the last remnant of what used to be a vast residential area. 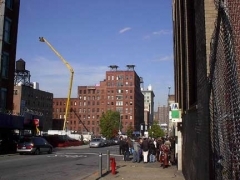 It is squeezed between the huge Con Edison plant on the north, Farragut Houses on the south, the Navy Yard (see below) on the east, and the more industrial part of DUMBO (“Down Under the Manhattan Bridge Overpass”) on the west. It appears pretty much as Brooklyn did in the mid-1850s, when most of these houses were built and many of these streets were laid out. Hudson Avenue (above) used to run from the East River continuously all the way south to Fulton, but only this brief 4-block stretch remains (and a one-block stretch near Fulton). Brooklyn’s Fifth Avenue El also rumbled over Hudson Avenue, past brick buildings that looked like this, before both the el and the avenue were obliterated and the Farragut Houses, the Brooklyn-Queens Expressway, the Raymond-Ingersoll Houses and Long Island University were constructed in their place. 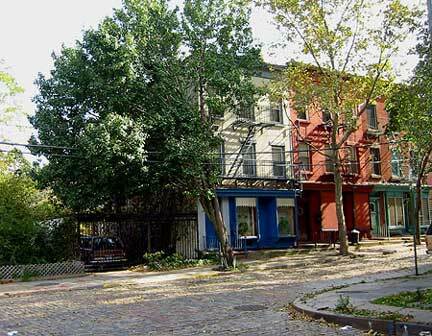 Vinegar Hill has been here since 1800, when a John Jackson purchased its land from the Sands brothers (for whom Sands Street is named). Jackson actually hoped to attract Irish immigrants in an era when Irish were otherwise unwelcome. 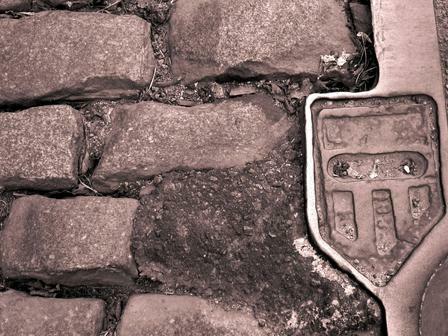 He named his tract Vinegar Hill after the site of a fierce battle in the unsuccessful Irish rebellion of 1798. In Ireland, the name “Vinegar Hill” was an English transliteration of an Irish Gaelic term meaning “hill of the wood of the berries.” Vinegar Hill has also been known as Irish Town. 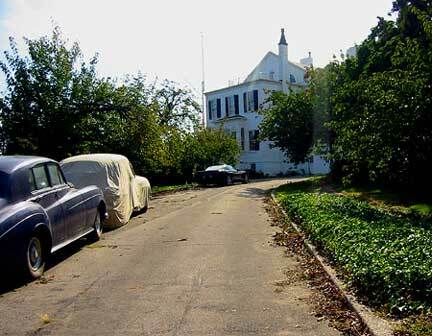 The Naval Commandant’s House, the crown jewel of the Brooklyn Navy Yard, is visible behind a locked gate from Little Street in Vinegar Hill. It was built between 1805 and 1806 and is purportedly the design of Boston’s Charles Bulfinch. Bulfinch designed the U.S. Capitol Building as well as Faneuil Hall and the State House in Boston. The New York Naval Shipyard, known popularly as the Brooklyn Navy Yard, was established by the federal government in 1801. Robert Fulton’s steamship was built here and launched in 1815; the battleshipMaine in 1890, as well as the first angled-deck aircraft carrier, theAntietam, were also built at the Navy Yard. The Navy Yard at its peak just previous to World War II employed 10,000 workers. It has 5 miles of paved streets; 4 dry docks ranging in length from 326 to 700 feet; two steel shipways; and six pontoons for salvage work. The Navy Yard was decommissioned in 1966. 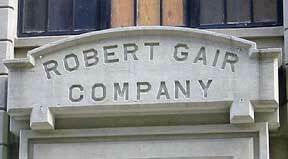 It is now a center for private manufacturing and industrial parks, and is still, unfortunately, closed to the public. 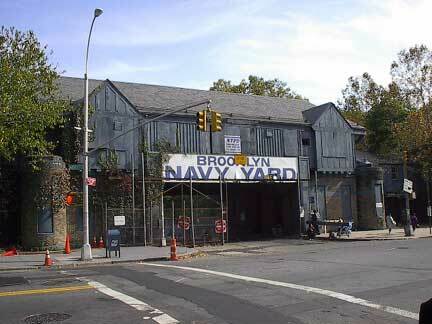 “Today Sands Street caters to sailors and Navy Yard workers. Shop windows display outfits for sailors; bars and lunchrooms, quiet during the day, come alive at night as their customers arrive.” Sands Street, now dominated by Farragut Houses on each side, was once Brooklyn’s red-light district; these days, it’s almost eerily quiet. 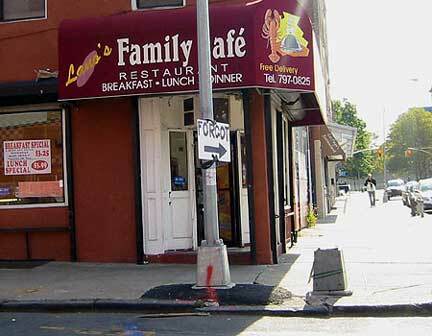 Another sliver of old Brooklyn can be found in the small triangle centering on Concord and Duffield Streets and the Flatbush Avenue Extension. 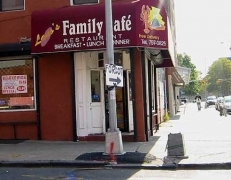 This neighborhood was compromised as early as 1909, when the Flatbush Avenue Extension was rammed through, extending Brooklyn’s signature avenue to the new Manhattan Bridge. 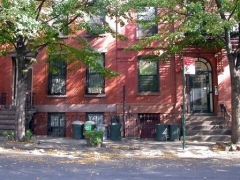 Elsewhere in the area, the Ingersoll Houses, Parkes Cadman Plaza and Metrotech all did in the rest of the neighborhood. 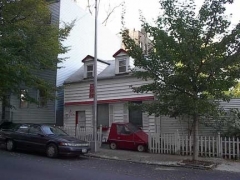 But here, a small slice of the 19th Century remains, including one of Brooklyn’s smallest houses and what is either a golf cart or Brooklyn’s smallest car. 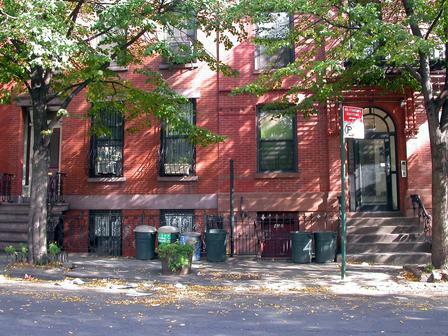 Duffield is named for the family that produced one of Brooklyn’s first medical doctors. 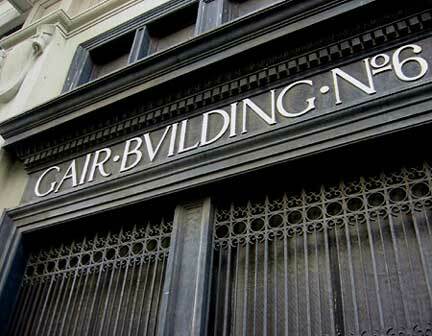 Gair founded a paper empire and occupied several buildings in the area, many of which still bear his name. They just look like trolley tracks. The Jay Street Connecting Railroad operated as Brooklyn’s smallest waterfront railway between about 1900 and 1958. 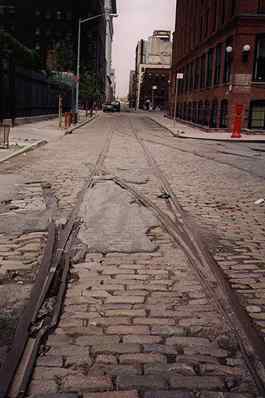 The role of this small railroad was to move freight cars from carfloats on the East River to the industrial buildings and warehouses that would load and unload them. You can still see a few cases in which long-unused tracks are going into buildings. Thus, the JSCR filled about the same role as the old “High Line” on Manhattan’s West Side. The old JSCR yards are now occupied by the vast Con Edison plant as well as the spanking new Empire-Fulton Ferry State Park, completed only in 2003. It is part of a plan to make the entire Brooklyn waterfront between the Manhattan Bridge and Atlantic Avenue landing a waterfront park. The Arbuckle brothers owned the Jay Street Connecting Railroad in the 1930s, and used it in their importing business, shipping in Yuban Coffee. 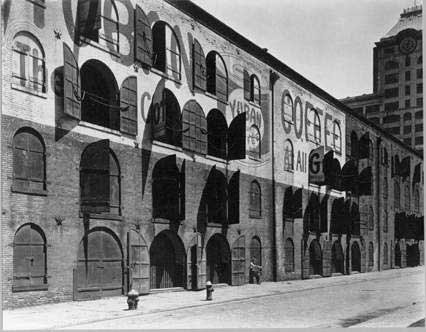 Yuban had a vast advertisement on the exterior of these 1860s-era warehouses along Water Street, known as the Empire Stores. 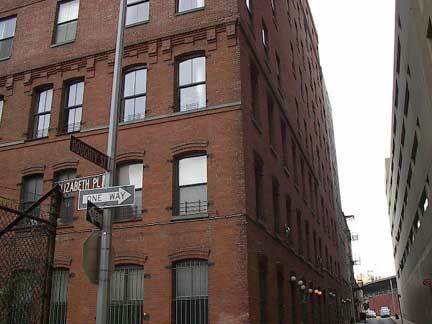 The building awaits conversion, either to retail space, or, undoubtedly, pricey apartments. Surprisingly, Little Street (which is one block long) is where we encountered our most persistent traffic problems. They didn’t plan it like this, but…from Washington Street, the Brooklyn tower of the Manhattan Bridge, with the Empire State Building visible exactly between its columns. 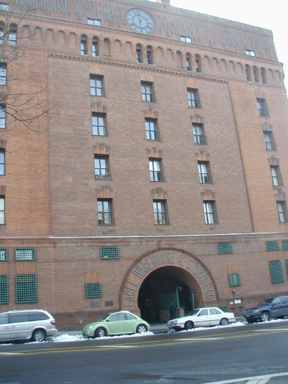 The Eagle Warehouse was built by architect Frank Freeman in 1893 on the site of the oldBrooklyn Eagle newspaper building. The Eagle published for 114 years, from 1841 to 1955; it was edited by Walt Whitman from 1846 to 1848. Whitman was ousted in a dispute with Eaglemanagement; he was anti-slavery, they weren’t. 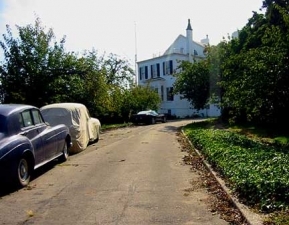 Whitman went on to edit the New Orleans Crescent, but spent much of his career on Long Island. The Eagle Warehouse Loft. You won’t believe this! End of an era. Fulton Street, named for steamship pioneer Robert Fulton, will soon be known as Harriet Tubman Boulevard, after the Civil War era Underground Railroad pioneer. 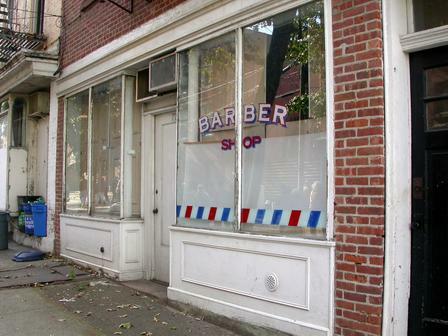 This short section of it near the waterfront has been known as Old Fulton Street since the 1980s and is likely to keep its name. Frank Freeman left a small section of the old Brooklyn Eagle building, inclusing its old pressroom. Walt himself may have worked on the third floor. Thanks to Forgotten Fans Jessica Benoit, Rachelle Bowden, Tien Mao, Eric Weaver and the other 52 Forgotten fans who accompanied me on Forgotten Tour 15. Check the home page regularly for when/where the next tour will be! 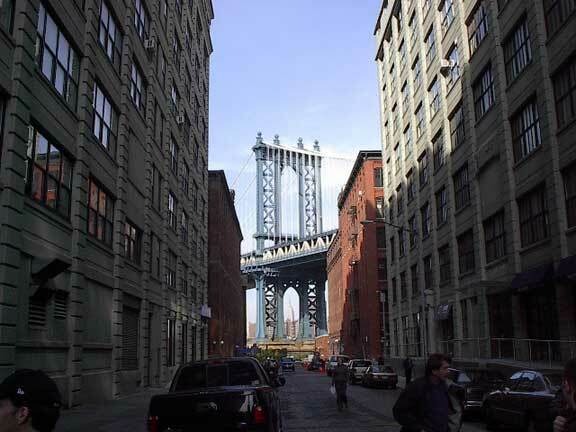 Have you been to… DUMBO?